Mexico continues to struggle under US President Donald Trump’s uncertain protectionist policies. 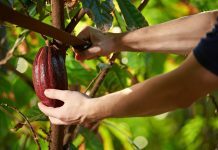 The Trump administration is contemplating big changes to the North American Free Trade Agreement (NAFTA) that could have a serious impact Mexico’s economy. 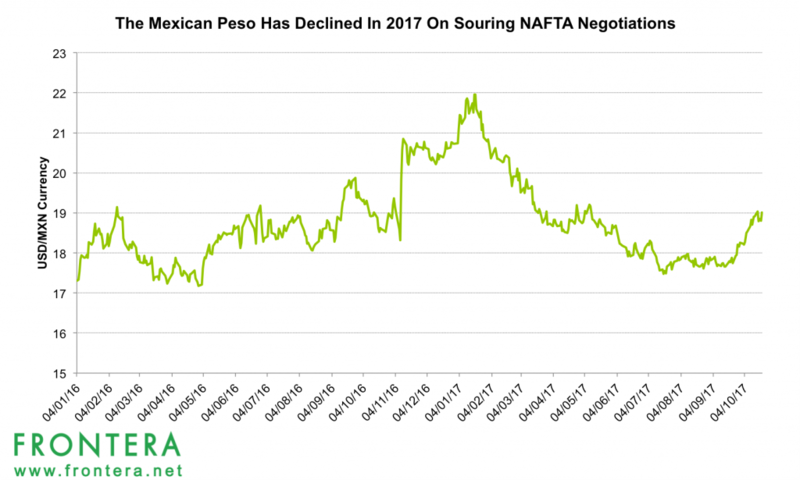 Concerns over the ongoing fourth round of NAFTA negotiations have hit the Mexican peso, driving it to five-month lows last week. 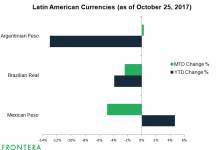 In the last six months, the Peso has plunged nearly 6%, making it the worst performing emerging market currency in the period. Mexican stock markets have also struggled through the year as Mexican companies feel the heat over a decline in exports. 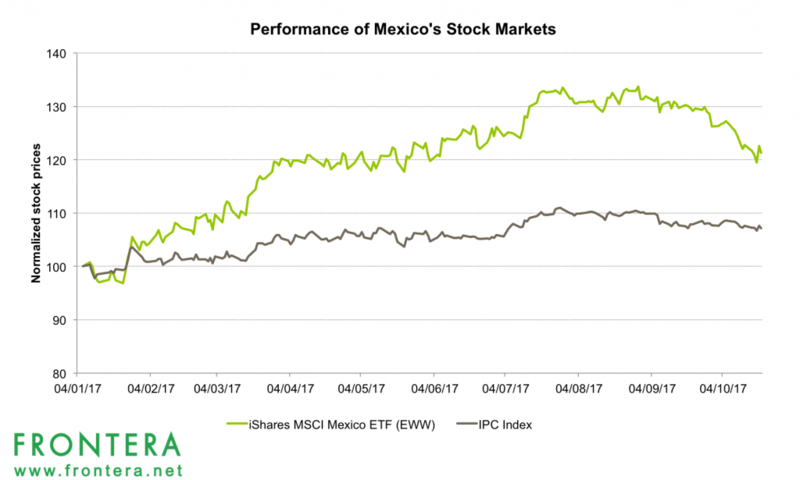 The iShares MSCI Mexico ETF (EWW) is down 6.8% over the last one month, while the benchmark IPC Index has lost 2% in value. Moody’s forecasts Mexico’s GDP could decline by 4% if the NAFTA pact is terminated. Even though this decline is lower than the 6.5% decline in GDP during the 2009 financial crisis, it would lead to a “severe confidence shock” for the broader economy. Barclays expects the cost of manufacturing would rise by 10-12% in Mexico due to added tariffs if NAFTA is revoked. 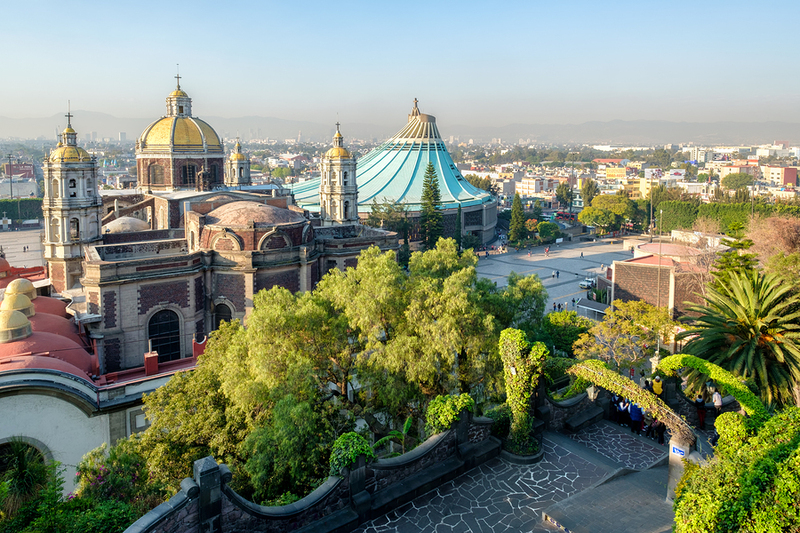 Mexico’s exports to the United States make up nearly 25% of its GDP, resulting in considerable risks for export-oriented enterprises in the event that NAFTA uprooted. 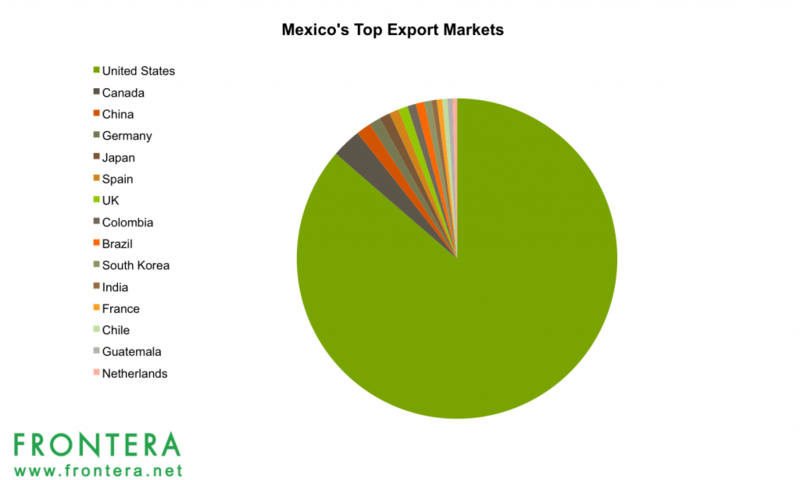 Mexico is the third largest trading partner for the United States, just behind China and Canada. In 2016, US imported goods worth $294 billion. 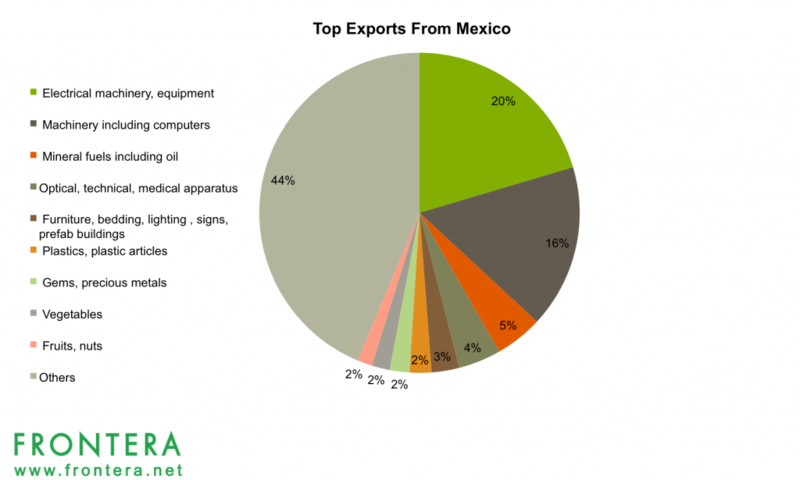 Vehicles make up nearly 24% of total exports from Mexico, while electrical equipment, machinery including computers, and mineral fuels make up 20%, 16.5% and 4.8% of exports respectively. 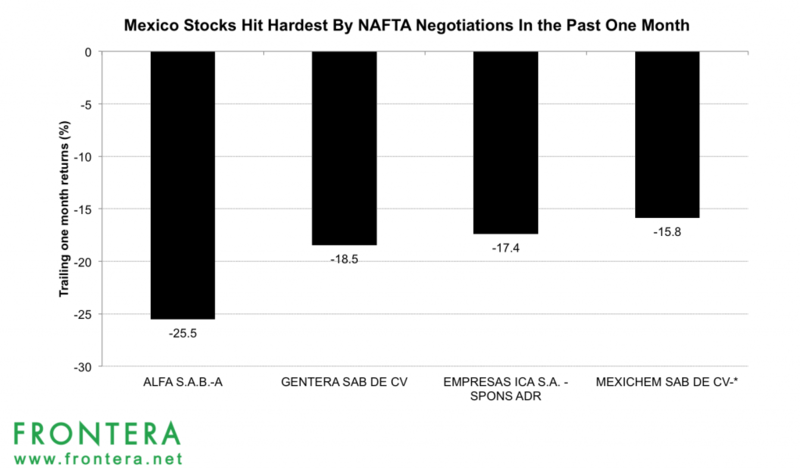 These sectors will be hit hardest in case tariffs are imposed on imports from Mexico. Large export-oriented corporations are most at risk to the potential implementation of trade barriers by the United States. This includes large companies like Alfa Sab Mexico, Gentera SAB, Empresas ICA and Mexichem SAB. Amidst ongoing NAFTA negotiations, in the last one-month, shares of these companies have tanked 25%, 18%, 17% and 16% respectively. Alfa Group is a Mexican conglomerate with diversified businesses ranging from petrochemicals, auto components, FMCG, oil & natural gas and IT/telecom services. The company is the world’s largest producer of engine blocks and cylinder heads for automakers. Alfa operates in 21 countries across the world. The company operates under five major business heads Alpek, the petrochemical company; Nemak, the aluminum auto components company; Sigma Alimentos, the refrigerated foods company; Alestra, the IT & telecom company; and Newpek, the oil and natural gas extraction company. 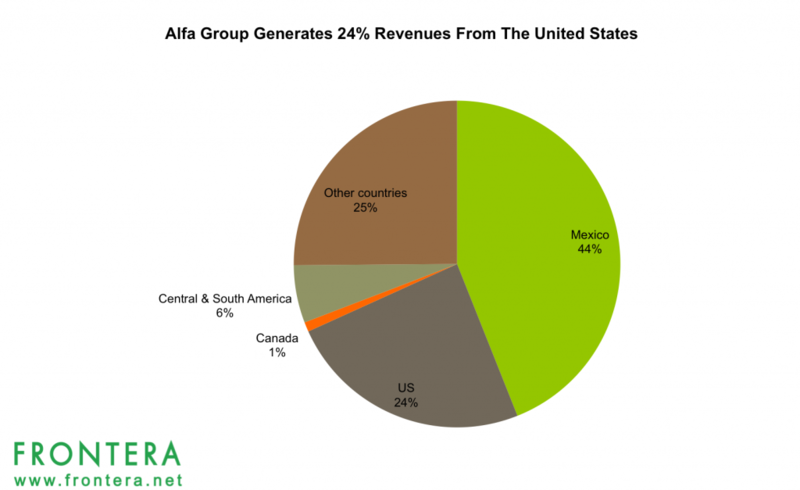 In 2016, Alfa group generated nearly 24% of its revenues from the United States, thereby putting it at significant risks to the withdrawal of the NAFTA pact. Alfa Group is currently listed on the Mexican Stock Exchange and the Berlin Stock Exchange with tickers ALFAA.MX and G4L.BE. The company’s shares are also listed on US OTC Markets with ticker ALFFF. Furthermore, the company is a constituent of the Mexican benchmark index IPC and leading S&P and MSCI Indices tracking Latin American securities. In the last month, shares of the company have declined nearly 26% making it the worst performer among its peers. YTD in 2017, shares of Alfa Group lost 14% in value. Gentera SAB, earlier known as Compartamos SAB de CV, is a Mexico based financial institution engaged in the business of providing banking and credit services to low-income individuals and communal banks. The company operates in Mexico, the United States, Guatemala and Peru, through its various subsidiaries: Compartamos Banco, a micro-financing bank; Yastas, a network of affiliated merchants that provide payments and financial transactions, Pagos Intermex the payment of family remittances company and Aterna, an intermediary between the distribution channels and the insurance industry. Gentera is currently listed on the Mexican Stock Exchange with ticker GENTERA.MX and on US OTC Markets with ticker CMPRF. The company is also a constituent of the Mexican benchmark index IPC and leading S&P and MSCI Indices tracking Latin America securities. In last month, shares of the company have declined nearly 18%. YTD in 2017, shares of Gentera lost 17% in value. Empresas ICA is a holding company engaged in civil and industrial construction, real estate and home development, and operates infrastructure facilities, including airports, toll roads, and water treatment systems. The Company operates in five segments: civil construction, industrial construction, concessions, airports, and corporate and others. 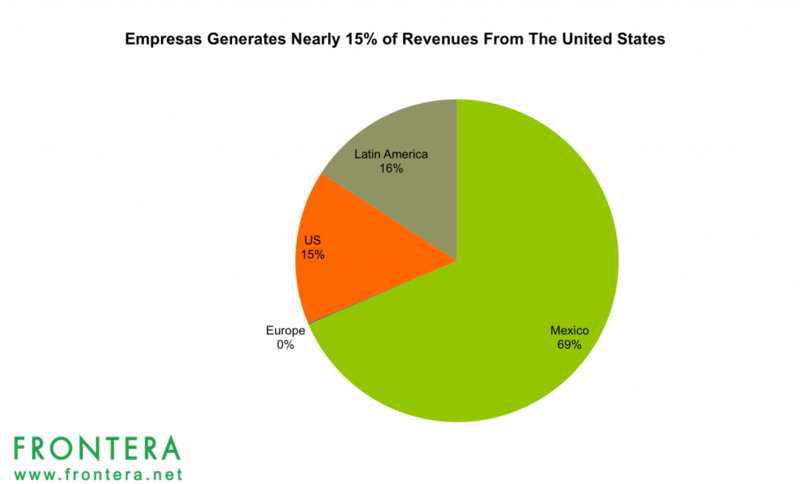 Empresas has a significant presence in Mexico, Spain, United States as well as other Latin American countries. In 2016, the company generated 15% of its revenues from the United States, its largest market outside of Mexico, thereby exposing it to risks in case of termination of the NAFTA agreement. Empresas is currently listed on the Mexican Stock Exchange with ticker ICA.MX. The company is also a constituent of the Mexican benchmark index IPC and leading S&P and MSCI Indices tracking Latin America securities. In the last month, shares of the company have declined nearly 17%. YTD in 2017, shares of Empresas have lost 84% in value. Mexican Sab is one of the largest chemical and petrochemical companies in Mexico. The company has a diversified product portfolio ranging from telecom, infrastructure, housing, drinking and water in countries like Mexico, the USA, Europe, Asia, Africa (South Africa), Middle East (Oman), and Latin America. Mexichem operates under the following business heads: Vinyl, which is involved in the extraction of chlorine, caustic soda and chlorinated derivatives; Fluor, which is focused on the extraction of fluorite, as well as production of hydrofluoric acid and cooling gases; Fluent, which includes the manufacture of pipes and fittings made of PVC, polyethylene and polypropylene, as well as geo-synthetic tubes and connectors, and Energy, which comprises power cogeneration for internal and third-party consumption. The company operates through various subsidiaries across the globe. 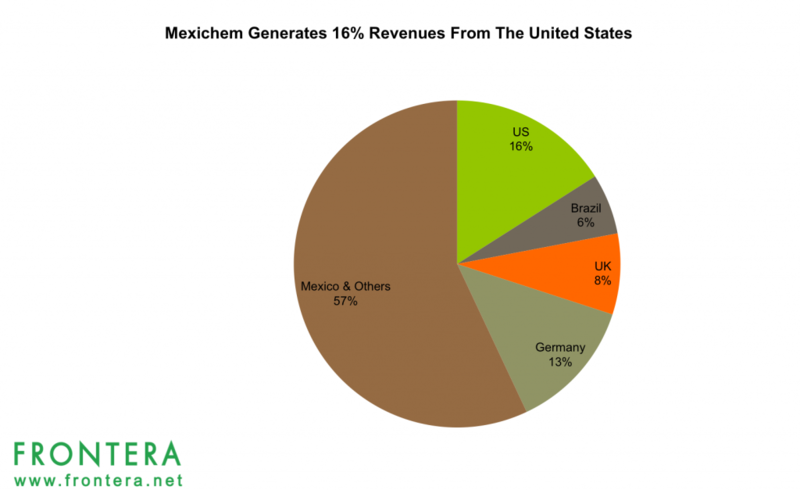 In 2016, Mexichem generated nearly 16% of its revenues from the United States, thereby putting it at significant risk to a withdrawal of the NAFTA pact. Mexichem has been listed on the Mexican Stock Exchange for the past 30 years with ticker MEXCHEM.MX. The company is also a constituent of the Mexican benchmark index IPC and leading S&P and MSCI Indices tracking Latin America securities. In the last month, shares of the company have declined nearly 16%. YTD in 2017, shares of Mexichem have appreciated 9.2%. 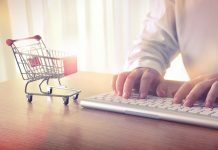 Will NAFTA Renogotiatlon Help E-Commerce Retailers Or Hurt The Industry? What Are The Biggest Blockchain And Digital Currency Initiatives In Latin America Right Now?